Thank you to the participants who submitted abstracts and who have registered for the symposium. I will be sending information about panel selections directly to the particpants who have been chosen to present within the next week. For those who would like to particpate in the moderated discussion, Andrea Ferber will be focusing on Chapter Two of Sunil Manghani’s book Image Critique and the Fall of the Berlin Wall (2008). Send an e-mail to me if you have any difficulty locating the book or are curious about the content. You still have time to register for the discussion and symposium. We welcome all visitors! This Graduate/Undergraduate Student Research Symposium was inspired by and serves to honor Dr. Annette Lermack, Associate Professor of Art History, upon her retirement from Illinois State University. Her dedicated professionalism is an example for all of us interested in continuing our scholarly pursuits and dreams. Sunil Manghani’s 2008 book entitled: Image Critique and the Fall of the Berlin Wall is the text that informs the theme of the symposium. This website was created to inform students, faculty, and community members interested in art of a local opportunity that will feature lively discussion about current trends in art. 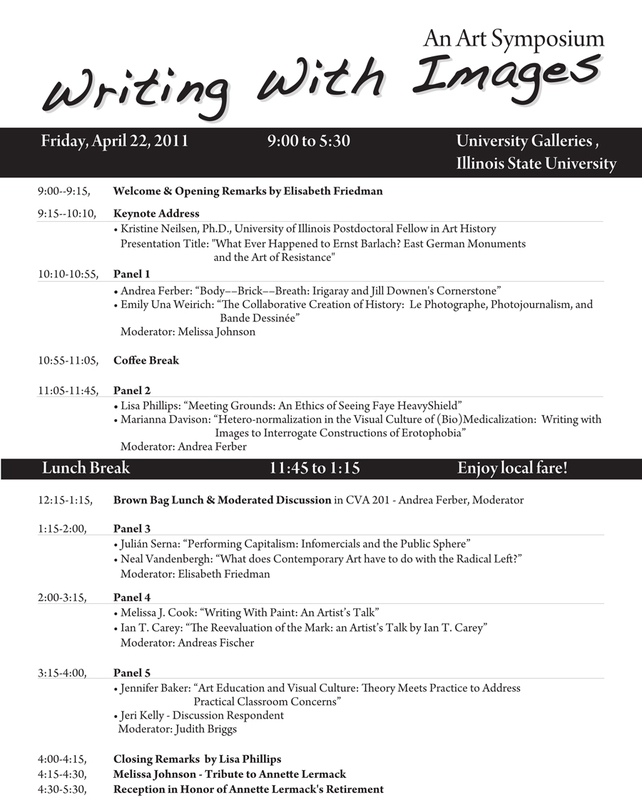 The symposium will highlight ideas about writing with images instead of writing about images, and it will feature, among others, the work of ISU and UIUC students. You will find a series of tabs that will allow you to be a contributor to the symposium, an active participant in the symposium, or an interested bystander of the symposium. Submission Deadline: March 18, 2011 Registration. Deadline: April 14, 2011 You will be notified of submission acceptance by April 7, 2011. April 22, 2011 from 9 a.m. to 5 p.m. There will be morning panels, a break for lunch, an afternoon panel, and a moderated discussion of a chapter of Manghani’s Image Critique and the Fall of the Berlin Wall (2008) facilitated by Andrea Ferber, University of Illinois Doctoral Student, and Illinois State Adjunct Faculty. Please join us for this interesting and unique local event!